Astrodon Tru-Balance LRGB Filters. Off-axis guided with STL-Remote using Astrodon ROAG. Data automatically acquired with CCDAutoPilot2.53. I used Rob Gendler’s LLRGB processing method. This mag. 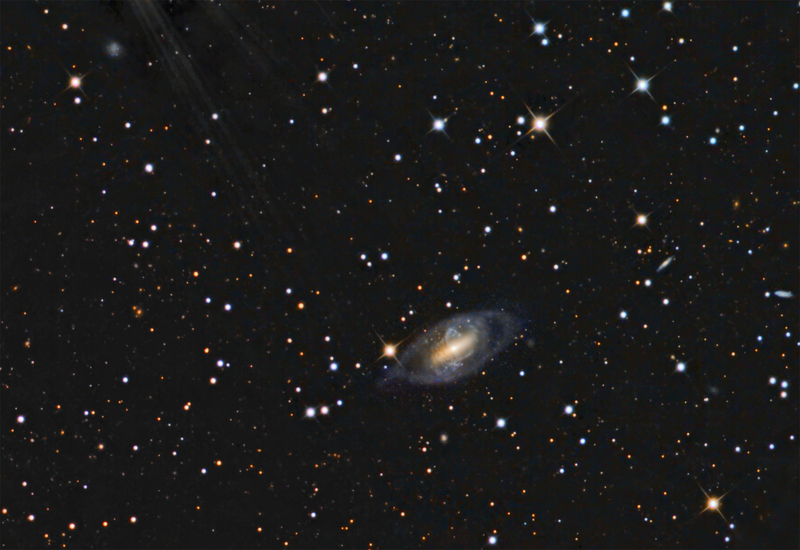 12.1 distored spiral galaxy (also listed at PGC 25065) is located near M81 and M82 in Ursa Major. There is an internal reflection coming down from the upper left from a bright star. I left this in because it seems to highlight the galaxy. I think this image shows the helical structure quite nicely, which was one of the goals of this project, even though considerably more time is needed, even on this 16" RC telescope. This galaxy is one of the last added to the Arp Database of Distorted Galaxies (#336 of 338). It seems to be similar to a polar ring galaxy, but there is what appears to be a helically wound structure around the central "bar" of the galaxy. From the SEDS database , this unusual galaxy is categorized as S0(pec) showing two axes of symmetry, as well as an encircling ring as in a polar ring galaxy. Physically, the polar rings are composed of stars and interstellar matter, i.e., gas and dust, and were probably generated by gravitational interaction, i.e., torn apart from smaller galaxies which happened to come too close to the larger "mother" galaxy, sometimes up to a complete merger with the small galaxy.